Cisco has an updated version of Cisco Mobility Express now—the easy-to-use management software for Cisco wireless products. Designed for networks of all sizes, Mobility Express provides industry-leading wireless LAN technology for your employees and customers. Cisco’s introduces affordable, easy-to-use wireless network devices that allow small- to medium-sized businesses to keep pace with ever-changing challenges. With Mobility Express organizations can quickly deploy a low-cost, high-performance solution. Mobility Express now supports up to 100 access points and can be configured in under 10 minutes, without any IT experience. Affordable for any sized business, Mobility Express has embedded the intelligence features of a Cisco WLAN controller into the Access Points. This means you get Enterprise-class wireless features without having to manage another network appliance. High-performance means that Mobility Express supports the latest 802.11ac Wave 2 standards and other features previously available only in high performance standalone WLAN Controllers. A small or medium-sized business will now be able to offer the same high-speed, feature laden network that larger organizations use. 100% decrease in disconnected calls. 86% reduction in loss of video. 50% reduction in major audio/video issues. Presence Analytics: Our Connected Mobile Experience (CMX) Cloud solution allows you to connect with your customers in a way that you’ve never been able to before. Whether it’s making Wi-Fi guest access simpler through easy guest onboarding, analyzing visitor behavior through presence analytics or engaging with your customers and offering a better personal experience while delivering them relevant content, you’ll be able to do it with CMX. Application Visibility and Control: You can’t control what you can’t see. Now you can get complete understanding of exactly what applications are running on your network. 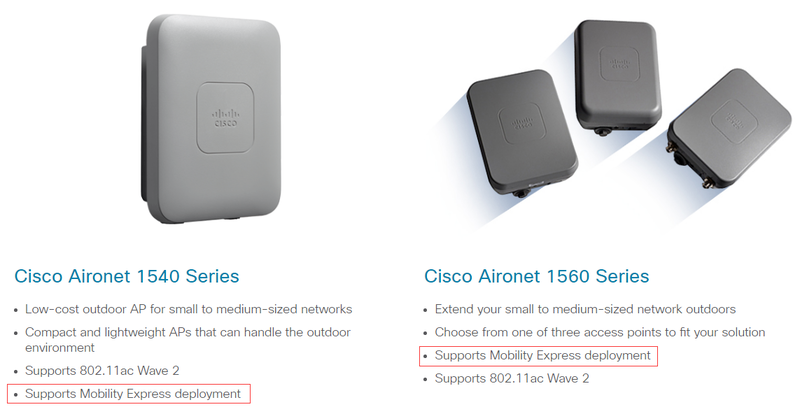 The Cisco Aironet 1815 Series Access Point is for indoor use while the Aironet 1540 Series are for extending your network outside. The 1815 Access Point series is made up of four, low-cost, sleek devices, which are easy-to-deploy and manage thanks to Mobility Express. These access points are perfect for retail, educational organizations, those in the hospitality world and for tele-workers. 1815i provides enterprise-class connectivity at a small business price point. 1815t is designed specifically for teleworkers and micro-branch deployments. 1815w is created to be mounted to walls and is perfect for hotels, residential halls or other multi-dwelling units. 1815m is ideal for budget-conscious organizations, this access point is more powerful and covers larger areas. 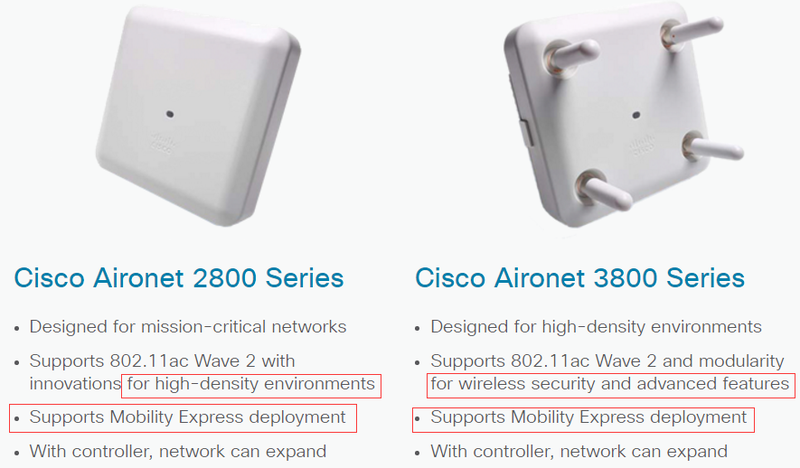 More about the Aironet 1815 Series Access Point: Which Aironet 1815 Model Is Right for You? While possessing similar functions to the indoor access points, the 1540 Series APs are made specifically for the outdoors. With its favorable price-point, ability to support 802.11ac Wave 2 standards and Mobility Express deployment, the Aironet 1540 is also tough enough to withstand the wilds of nature. The outdoor access points are perfect to provide extended access whether in outdoor shopping malls, truck stops or spreading your wireless network to the rest of your outdoor campus. When your business inevitably grows, you’re going to want to take your network with you. The best way to do that is by investing in another newly announced product: the Cisco 3504 Wireless LAN Controller. The 3504 can support more access points (up to 150) and more clients (up to 3000). This means that your growing business can keep the Cisco products already deployed in your infrastructure. Just launch the controller and add additional access points when needed. As you get more traffic on your network, the 3504 can keep up because it is designed to handle 802.11ac Wave 2, high-bandwidth traffic through its Multigigabit Ethernet ports. It’s not just more support and larger bandwidth, the 3504 comes complete with a rich feature set that provides more control and gives greater visibility into your network. It’s easy to see why the 3504 controller is going to be the top choice for organizations with growth on their mind.